Which of the 8 tiles below is missing? I've been trying to figure out the answer to this question for quite some time. Can anyone spot the pattern? Reading from left to right, the lines continue where the previous square left off, to make two long connecting 'strings' of sorts. The eighth square leaves off in the top righthand corner and about 80% of the way down the bottom side, which is where tile 5 would connect to. it must be Tile 3! You're all thinking to hard. This is just a game of Tic Tac Toe. Since it is the turn of X, tiles 1, 4, 5, 6, and 7 would all be correct. I personally would go with 7 because it's a well drawn X.
I think Bailey M has got the intended answer. 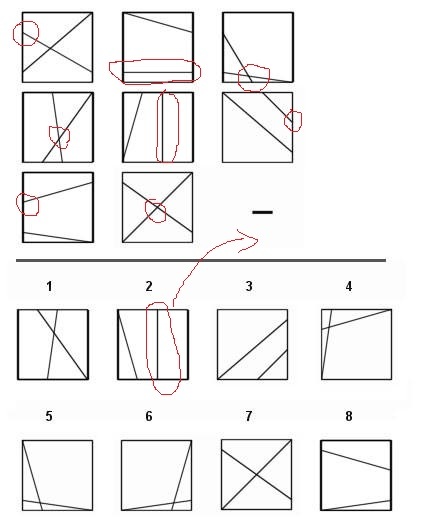 In each square, label the corners A-D, running clockwise from the top left. By "line" we mean a line inside a square. Call a line "par" if it is parallel to a side of the square. Call a corner "visited" if it is touched by a line. 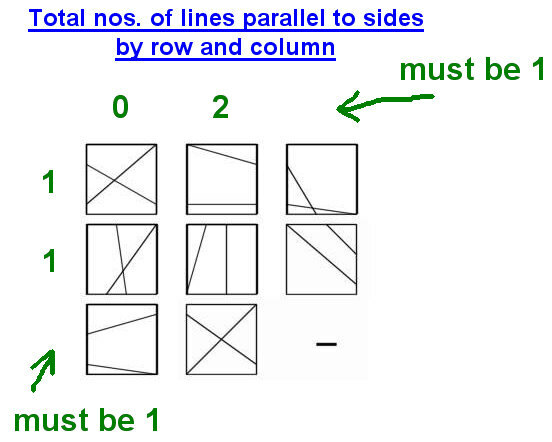 Consider the distribution of par lines by row. In rows 1-2 the totals are the same: each row contains exactly 1. To continue the pattern of sameness, row 3 must also contain exactly 1. 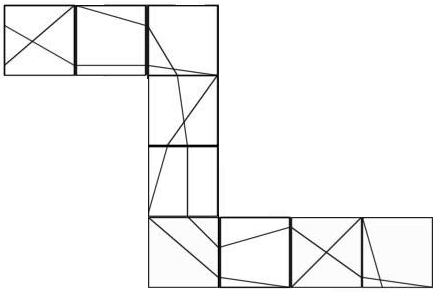 Of all the possible missing tiles, the only one that contains exactly 1 par line is tile 2. Now consider the distribution of par lines by column. In columns 1-2 the numbers are different: there are 0 in column 1 and 2 in column 2. Neither of the known tiles in column 3 contains a par line, so the total in column 3 can only be 0 or 1. To continue the pattern of difference, the number must be 1, so again the answer must be tile 2. Each fully known column contains exactly 2 squares in which the same corner is visited: in column 1, that is corner B; in column 2, corner C. So we need a tile that continues that pattern in column 3. The visited corners in the known tiles in column 3 are A and C. This restricts the possibilities for the missing tile to tiles 2 and 5. So when we choose tile 2, this pattern also continues. Of course this answer doesn't use all of the given information. For example, the horizontal line in the top middle tile could be translated upwards and everything would still apply. But the same is true of what appears to be the intended solution. 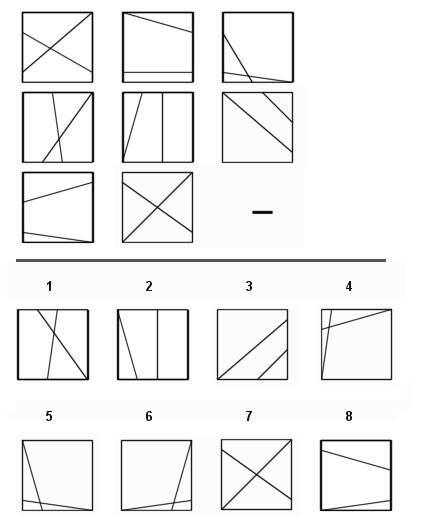 In that solution, it doesn't matter whether two lines in a square cross or don't cross, so long as they start and end so as to connect with the lines in adjacent squares. One could also say that going downwards for row 2 but left-to-right for rows 1 and 3 is a bit arbitrary. Our basis for deciding what we think is the best solution is subjective, or at least would take a lot of definition to be made objective. Tile 5 is the only one represented on the bottom that doesn't have a similar tile on the top. I'm not sure why there's so much reading into this... All the other tiles have a similar one on the top even if you have to flip it, etc. 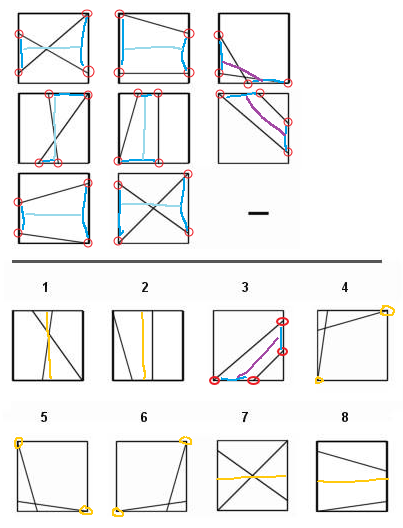 (3) because for every figure you see in a row one end of two lines lies on one side and other end on another side and also 2 out of 3 of such figures have such sides opposite to each other and one has it adjacent (note having line start at edge should be interpreted as in a favor of this hypothesis i.e. benefit of doubt goes to me). Same pattern is seen in row 2 and hence extrapolating it, I eliminate the eight-options to arrive at (3) which satisfies this rule. c) and one with a line starting from centre of a tile.